$25,000 final contribution to the Noosa Biosphere Reserve Foundation for the Noosa River Bring Back the Fish Project. With the Foundation continuing to wind up its activities, the total of grants paid in 2018 was lower than previous years but represented 39 per cent of the Foundation’s net assets at the beginning of the year. And while general administration and operating expenses were slighter lower than previous years the Expenses to Distribution ratio (EDR) was much higher at 10 percent. Over the Foundation’s 20 year life its EDR has averaged just 5 per cent due in large measure to the pro bono contributions of its directors. The Foundation has now paid out over $33.2 million in grants. This represents 107% of the gifts made to the Foundation by David and (the late) Barbara Thomas with income earned by the Foundation’s corpus more than covering the Foundation’s operating costs. Within specific projects, support funding continues to be leveraged at satisfyingly high levels; for example for the multi-million dollar Great Southern Seascapes project approximately $3 has now been generated for every $1 initiating support provided by the Foundation. As the Foundation continues to wind down, in line with Chairman David Thomas’s long-held intention to conclude its activities by 2018, grants paid this year represented 68% of the corpus held at the beginning of the year. “I am very proud to report that in 19 years of operation over $32.47 million in grants has been made by The Thomas Foundation to 30 June 2017. In fact, grants paid to date now represent 104% of the gifts made to the Foundation (the corpus). That is, investment income earned on the Foundation’s corpus over the years has more than covered the operating costs of the Foundation and has ultimately leveraged additional grant making. I am also very proud of the high levels of efficiency that have been achieved in the operation of the Foundation with the charitable administration expenses including corporate & administration, research, consulting and travel necessarily incurred in the operation of the Foundation being kept at a minimum. The study found the average EDR ratio for reporting funds is 28% though it acknowledged ratios varied significantly with staffed or smaller funds reporting higher ratios (as expected). In comparison, over the 19 years of operation, the Foundation’s charitable administration expenses only represents 5% of the total grants distributed. During the year ended 30 June 2017 the Foundation make 11 grants distributing a total of $4.12 million. The 2017 grants included $1.936 million to The Nature Conservancy for the Great Southern Seascapes program, $600K for the Barbara Thomas Fellowship with The Nature Conservancy, $1 million to the Asylum Seekers Centre, $100K to the Midlands Conservation Fund for conservation of the Tasmanian midlands, and the final instalment of $250K to the HammondCare Foundation for medical research. In addition grants were made to the Australian Environmental Grantmakers Network, the Australia Conservation Foundation (national symposium), the Noosa Biosphere Reserve Foundation (Bringing Back the Fish), the Australian Marine Conservation Society (capacity building), the Environmental Defenders Office (organisational development), and the Humane Society International. As the Foundation continues to wind down, in line with Chairman David Thomas’s long-held intention to conclude its activities by 2018, grants paid in 2015/16 represented 30% of the corpus held at the beginning of the year. Mr Thomas said: “I have always advocated that philanthropists should be careful not to exploit the tax benefits enjoyed by Private Ancillary Funds and believe it is incumbent on them to ensure efficient management of a foundation’s corpus and distributions. “I am proud that The Thomas Foundation has distributed over $28.35 million in grants over the 18 years of operation to 30 June 20 2016 – or 91% of the Foundation’s corpus – and that average annual distributions have readily exceeded the minimum distributions required by the Australian Tax Office,” Mr Thomas said. The Foundation’s objective is to report when it winds up that total grants paid exceed funds allocated to it by David and Barbara Thomas. That is, investment income earned on the corpus over the years has more than covered the operating costs of the Foundation and has ultimately leveraged additional grant making. In the year to 30 June 1016 the Foundation made 18 grants totalling $2.54 million. Grants included $500,000 to WWF and the Australian Marine Conservation Society (AMCS) for the Fight for The Reef Campaign; a total of $562,00to AMCS for coastal marine park campaigns in the Kimberley and Northern Territory; $225,000 to the HammondCare Foundation; $230,000 to The Nature Conservancy for its Ecological Sciences program; $200,000 to the University of New South Wales for its Healthy Brain Ageing Research; and $200,000 to the Australian Chamber Orchestra. Once again we have been enormously satisfied by the returns achieved by our investments, Mr Thomas said. Total grants of $4.6m were distributed over the 2015 year, representing 38 per cent of the Foundation’s net assets – easily exceeding the Australian Taxation Office’s requirement for each Private Ancilliary Fund to distribute a minimum of 5 per cent of its corpus. The grants were made to seven organisations and covered 13 projects in the environment, conservation, health and arts sectors. There was continuing support for the Fight For The Reef campaign, the Great Southern Seascapes program, the establishment of marine parks in coastal waters of the Kimberley and the Northern Territory, the Environmental Defenders’ Office in Queensland, the University of New South Wales Centre for Healthy Brain Ageing, HammondCare and the National Gallery of Australia. Corporate and administrative costs* were contained to 1 per cent to total expenditure and operating costs** to 2 per cent. Net investment earnings well exceeded operating costs. The Foundation met all its statutory reporting requirements to ASIC, the ACNC and the ATO. The Foundation’s grants distributed in 2014 represented 28% of net assets held at the beginning of the year and readily exceeded the Australian Tax Office’s requirement that PAFs distribute at least 5% of net assets annually. Grants supporting 19 projects were made to 11 organisations during the year, totalling $4.1m. The Fight for the Reef campaign, a Port Phillip Bay pilot for the Great Southern Seascapes program, campaigns for marine parks in the Northern Territory and The Kimberley, the University of NSW Centre for Healthy Brain Ageing, HammondCare, the Tasmanian Land Conservancy, Barossa Foundation, the Asylum Seekers’ Centre and the Environmental Defenders’ Office were among projects and organisations supported. Administrative costs were again held to a low 2% of net assets. Project development costs as a proportion of net assets were lower still. The Foundation’s asset base was boosted by a further gift from David and Barbara Thomas in addition to investment income of more than $1.2m. The gift established a sub-fund to facilitate the chairman’s discretionary support for minor projects. Grants made over the Foundation’s 16 year existence now total $21m. By the time the Foundation is wound up in 2018 it expects to have granted more than $35m. Leverage will bring the total benefit to more than $55m. Twelve grants totalling $1.97m were made to 10 organisations for 12 projects by The Thomas Foundation in 2012/13. The Fight For The Reef (FFTR) campaign was the biggest investment, with grants of $870,000 to the World Wide Fund for Nature Australia (WWF), $129,000 to the Australian Marine Conservation Society (AMCS) and $105,000 to the Environmental Defenders’ Office Queensland (EDO). Initiated by the Foundation, a coalition of the WWF and AMCS, with legal support from the EDO, guided development and implementation of community awareness and political advocacy campaigns focussed on emerging concerns for the Great Barrier Reef (GBR). This coalition encouraged other environmental NGOs to adopt common political objectives rather that differing or competing objectives. Some observers see this as an example of how future major environmental campaigns should be run. Momentum was brought to the campaign in March by marine environmentalist and author Professor Callum Roberts, from York University in the UK. Professor Roberts, the 4th David Thomas Conservation Orator, is author of The Unnatural History of the Sea and The Ocean of Life. 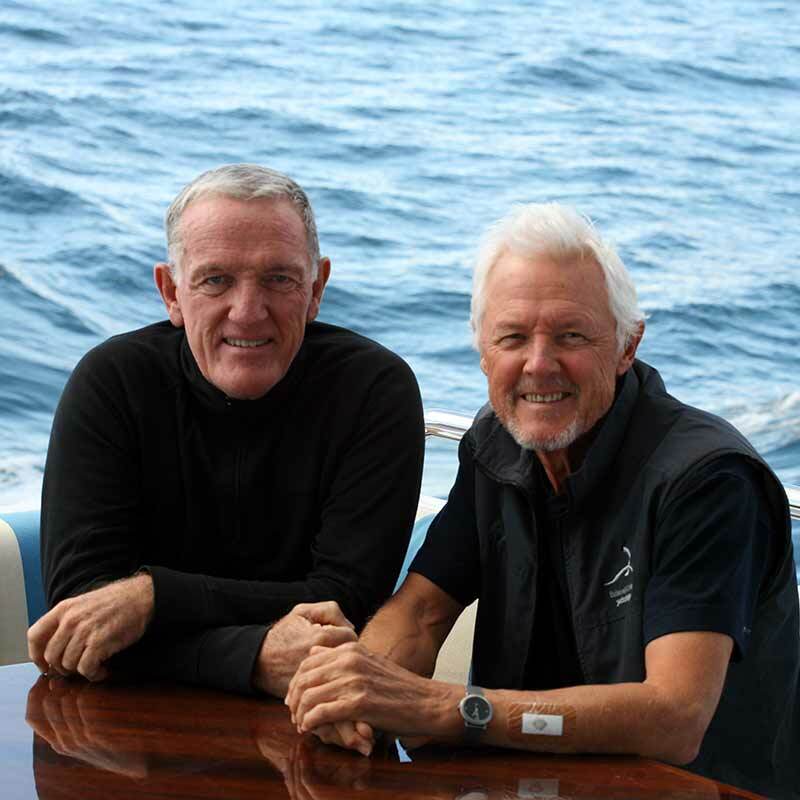 Professor Roberts brought attention not only to the looming GBR crisis, but also raised awareness to the worsening plight of the world’s oceans. Jeff Benz and Anna Simmonds of TNC’s Worldwide Office who are developing a policy paper, based on US experience, that identifies taxation and other impediments inhibiting the broadening of Australia’s philanthropic sector. While more than two-thirds of the grants in 2012/13 were to environmental activities, including the marine environment, the Foundation continues to support projects in other areas including the health sector. Beginning this year, the Foundation has made a $2.5m commitment over five years to Hammond Care’s participation in the National Health and Medical Research Council’s project – ‘Dealing with Cognitive and Related Functional Decline in the Elderly’. The mid-point of a $1m five-year commitment to the University of NSW’s Centre for Healthy Brain Ageing is approaching. Grants distributed in 2012/13 accounted for 14 per cent of the Foundation’s net assets, matching the annual average distribution over the past decade. Corporate and administrative costs were again held to a low 3 per cent of total expenses, while operating costs (research, development and travel) were held to 4 per cent of expenses. This tight containment of costs continues to be a hallmark of the Foundation’s activities.